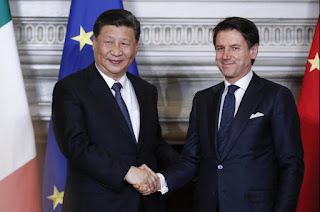 Despite the warnings and pressure from the US and the Europen Union, Italy has joined China's mega connectivity scheme and has become the first G7 country to do so. Italy is the thirteenth European Union country and also the first from Western Europe to join China's Belt Road Initiative. Italy has stated that its participation in the initiative through a non-binding agreement was aimed to "rebalance an imbalance" in Sino-Italian trade. There are a lot of 'Made in China' coming into Italy and too little 'Made in Italy' that goes into China. Italy hopes for a substantial and gradual increase in exports to balance out the trade imbalances. The decision of Italy is seen as an attempt to address its financial woes which has onerous public debt. Italy fell into recession at the end of last year. The agreement is seen as a trade off wherein Italy needs investment and China has those investments to provide to Italy. The agreement will aid Italy to underpin and strengthen its business ties with China. The paper released by the EU's diplomatic arm referred to Belt Road Initiative as a "systemic rival" and has threatened to tighten regulations on Chinese investment in Europe. Q. Which country has joined China's Belt Road Initiative and has become the first G7 country to do so?